As I shuffled the cards to select this week's Intuitive Tuesday tarot card, I said, "Tell me what messages I need to bring to my readers this week." 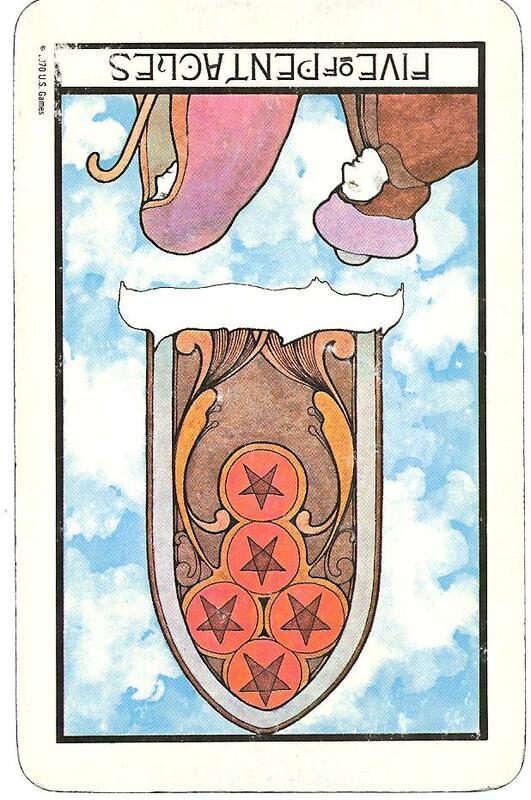 I selected the Five of Pentacles (reversed) from the Aquarian Tarot Deck by David Palladini. Fives are sometimes known as the cards that upset the balance. Remember, the fours are like a table with four, sturdy legs...so that no matter which suit, there is a feeling of stability. Then the five comes along and knocks the table over. This can be a time of uncertainty, change and disruption. With Pentacles, it has to do with the material world, your body, and/or business and finances. That doesn't help much particularly during this time of the year when you've possibly overeaten and feel physically drained, or you've been (maybe too) free with your spending, knowing that soon the bills will come due. Before we get to the Reversed meaning, it's helpful to understand the upright meaning. The Five of Pentacles typically shows two people walking outside of a stained glass window, possibly a church building. They look cold and lost, and there is no door for them to walk through and feel any type of spiritual connection. When I look at this card, the phrase that comes to me is "feeling left out," as though I've forgotten that even when I am alone, I am spiritually connected to all. Pulling the Five of Pentacles may indicate a time to do some soul searching. Do you feel as if you've lost your way? Are there simply too many obstacles or too little strength and direction to proceed forward? Maybe you are bringing past problems into current situations and feel down and out. 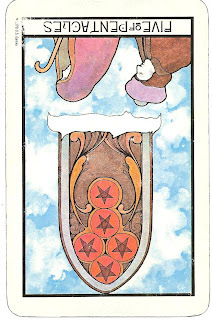 When you feel like this, it may be time to take special care of yourself, and re-connect with your source...which is what the Reversed card would indicate. The Five of Pentacles (Reversed), shows that you can move past these isolated and shunned feelings and find your strength again. This is a perfect card for the beginning of the year. Perhaps it's a habit you are ready to be rid of, a negative thought pattern, an unhealthy eating routine, a job that doesn't work for you any longer. You probably already have an idea of what needs to be left behind. Focus on moving through the Five of Pentacles and seek the abundance and flow of the Six of Pentacles. Remember, it's just one slice of the pie, one phase of the cycle. It's time to move on and flourish. I like that phrase: out with the old, in with the new! Maybe I mentioned that on Dec. 7 I was offered a wonderful (and challenging) new position by our new Director. I accepted wholeheartedly and went off on my birthday trip to San Francisco with a song in my heart, and wings on my feet. On Dec. 21, he announced he had hired a previous employee (one who had done the job before) and she would start on January 3. After my initial shocked reaction, I truly felt that Divine Order was working in my life. He actually then asked me to be her assistant. It took a couple of days to get there, but I was able to genuinely say, Yes, I will. I met her yesterday and she is delightful, overwhelmed, and grateful for the possibility of our being a team! My sense is that we will share this job and do better for it. So - out with the old ideas of how things and people should be and act - and in with the new ways of doing and being...perfect for 2011. My mind went right to the gallbladder surgery I just had, less than two weeks ago. I'm feeling well in my recovery, but my body is definitely asking for different things than before (or perhaps it was already asking for them, but I wasn't listening?). This new year (and the surgery) is inspiring me to take good care of myself and give my body what it wants. Interesting card. I definitely feel thrown off balance lately. I have been meditating to know the way. Some things take time. Definitely feel there are many obstacles and time just goes so quickly.